The philosopher Ludwig Feuerbach said “man is what he eats”. I would say that a man is also the books he reads and Drive, the book of Daniel H.Pink about motivation is one of those books that can influence you and change the way you think, inspiring you to act. An amazing book. 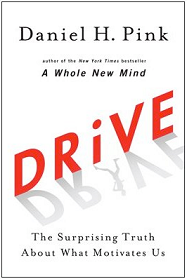 Drive teaches us that, when it comes to motivation, there’s a gap between what the science knows and what business does. “The current system of motivation put in place in organizations often doesn’t work and often does harm. If we want to build better organizations, elevate our lives and improve the world a new approach is needed”.